Hop on your flying carpet and take an amazing 3D journey on Blu-ray in December! 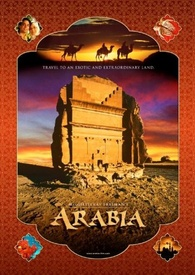 In an early announcement to retailers, Image Entertainment is working on 'Arabia - 3D' for Blu-ray on December 6. Academy Award® winner Helen Mirren (The Queen) takes the viewer on a tour de force that explores the mystery and mystique of Arabia. Breathtaking cinematography illuminates graceful deserts and brilliant skies…and in a series of stunning time-lapse images, you have suddenly joined the Hajj: a pilgrimage known as the largest single human gathering on Earth. Investigate tombs, coral reefs, shipwrecks, lost cities, trade routes long forgotten: ancient civilizations of incomparable beauty. A thrilling journey for the entire family, MacGillivray Freeman’s 'Arabia' offers a deeper understanding of a fascinating culture and a powerful, influential history. It reveals a way of life that has largely remained hidden…until now! The Blu-ray will feature 1080p video, a DTS-HD Master Audio 5.1 soundtrack, and supplements include: Featurette - The Making Of, The MacGillivray Freeman History, and Trailers. You can find the latest specs for 'Arabia - 3D' linked from our Blu-ray Release Schedule, where it's indexed under December 6.